Sew what's cooking with Joan! 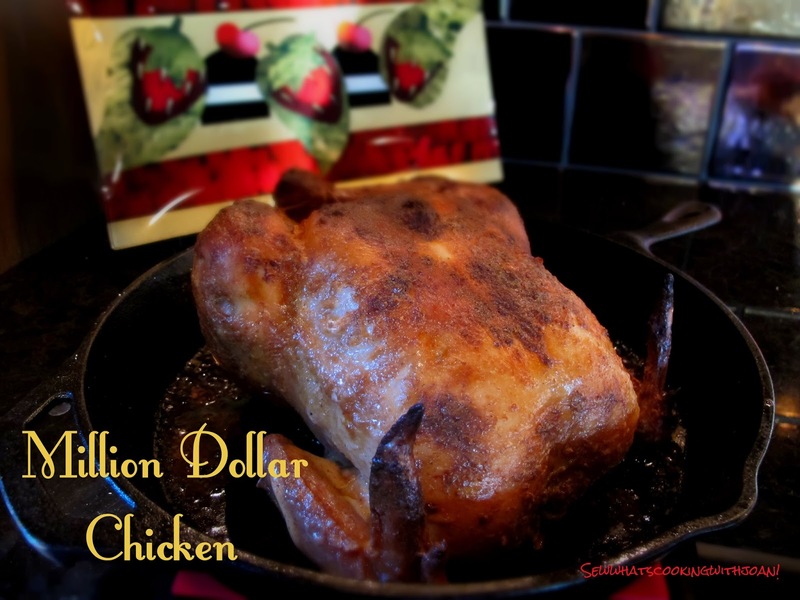 : Million Dollar Chicken! This recipe starts simple and is simple! 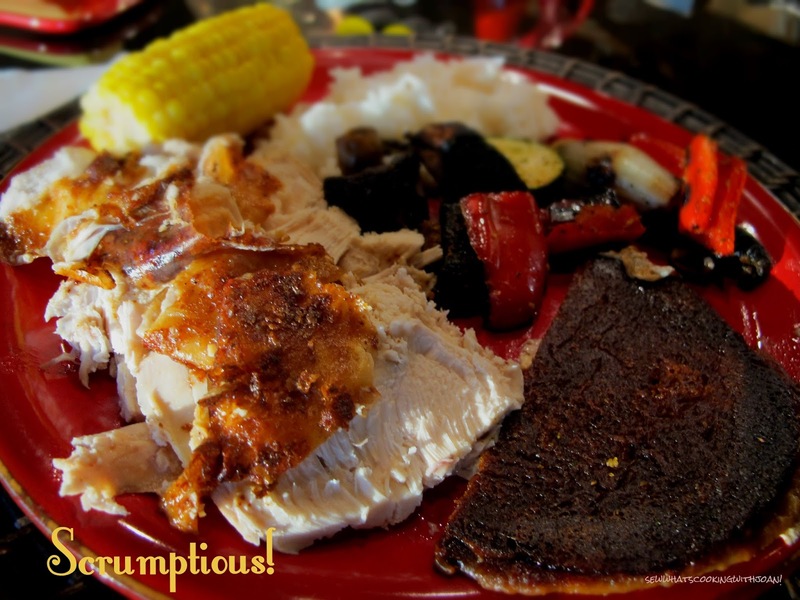 The twist is the thick piece of sour dough bread you place under the chicken. Throughout the roasting process it is soaking up all the scrumptious juices of the chicken and developing a crusty bottom! YUM! 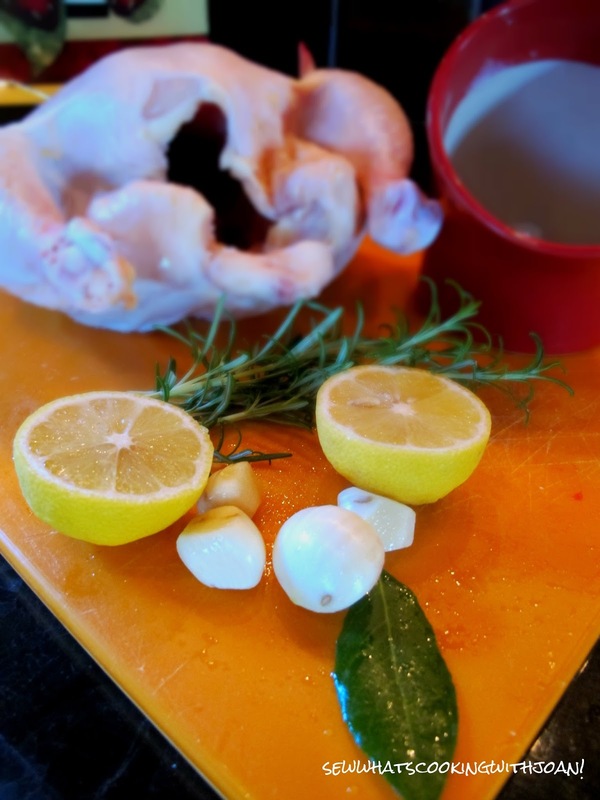 30 minutes before roasting, take the chicken out of the refrigerator and preheat the oven to 475 F.
Season the cavity of the chicken with salt and pepper, then stuff the cavity with garlic, halves of lemon, bay leaf and rosemary. 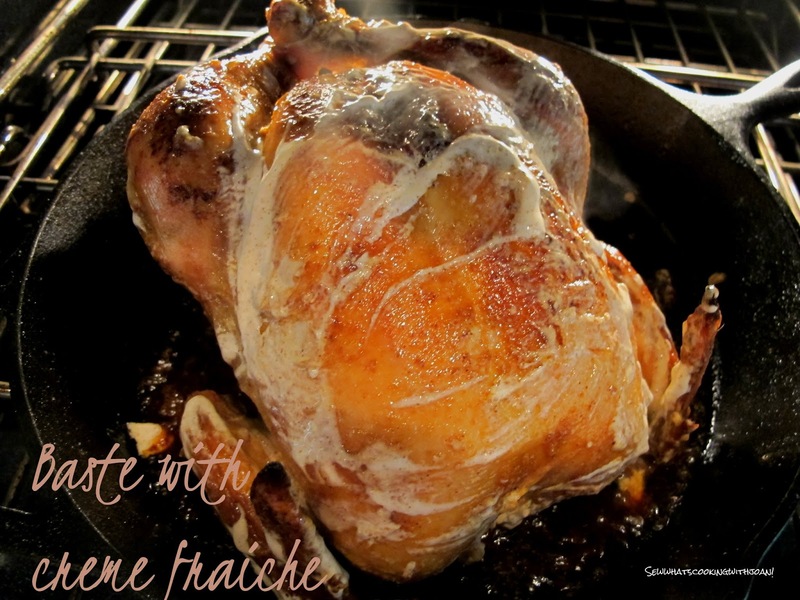 Truss the chicken with kitchen twine, season the outside with salt and pepper. Place a piece of bread in a medium pan ( I used an iron skillet) and put the trussed chicken on top of the bread. Trust me you are going to love this and you and your family will have a blow out fight over this piece of bread!! Roast the chicken at 450 F for 30 minutes, then reduce the temperature to 375 F, and continue cooking for approximately 40-50 more minutes(this time varies depending on size of your chicken). When the chicken is almost done, temperature reading 150 F degrees. mix the paprica into the creme fraiche, and brush all over the chicken. Continue to roast the chicken and baste every 10 minutes until the kitchen thermometer reads 165F degrees in the thickest part of the chicken, which is between the breast and the thigh/leg. Remove the chicken and let it rest for 15 minutes, before carving. At this point, a smart chef, would eat the crouton and not tell anyone about it!! I slice it up, but, you can quarter it, if you prefer. All I know is I cannot go back to roasted chicken ever!! It is "million dollar chicken" for me!! 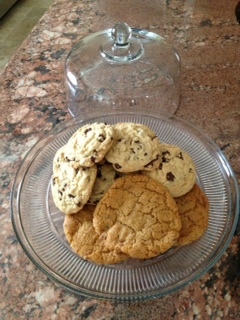 A follower in Chicago text a picture of the cookies she made over the weekend......errrrrrr- what was left of them!! Thanks Lisa! Tink's chocolate chip cookies! And JJ's peanut butter bacon cookies! These next few months will be a lot of travel for me. When I say a lot....I mean a lot!! I will have in one case over night to repack and fly out! All fun stuff, Wee Bear and I are traveling to some of our favorite places in Europe and some new places too, with friends. A few trips covering from east to west in the United States!!...... So, what does this mean to you...well most likely fewer posts! So, if you haven't already, choose to follow me and be notified when I post! I will not be setting a specific day! The rule of thumb is to fit the pan to the food. Thank you for commenting! Chicken looks moist and delicious! Did you serve with roasted veggie and mashed potato? Hi Amy! I served it with Basmati rice and roasted vegetables, delish!! Thank you for baby sitting today! Holly and I hiked Mt. Si and loved it!! Thanks for the pictures, fun text's and the video!! You had us giggling!! Love you!